Charlie Palmer Needs Our Help. 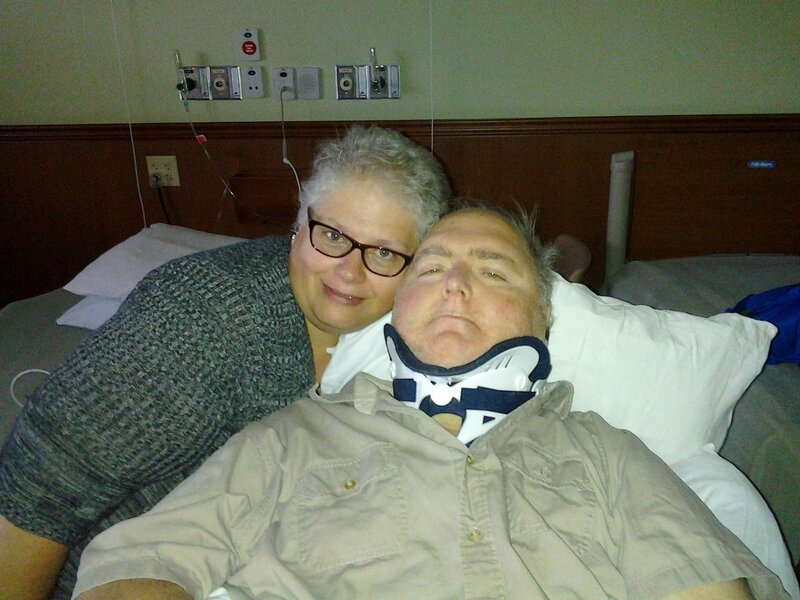 As many of you may know, Charlie suffered a life-changing spinal cord injury following a skid/steer accident on Labor Day. Charlie has spent the last two months in two different hospitals, and is now in a rehab facility undergoing extensive rehab exercises and therapy. He is scheduled for release from Allied Rehab sometime in November. Charlie has regained some use of his arms, very limited use of his hands and no use, as yet, of his legs. Even with insurance, Charlie will have many uninsured injury-related expenses such as: co-pays and deductibles, additional rehab not covered by insurance, home healthcare professionals, home modifications, a ramp and transportation to and from doctor appointments and rehab. In home rehab therapy alone is expected to be in excess of $50,000. The CDC estimates that an individual living with a spinal cord injury will have lifelong out-of-pocket expenses totaling $500,000 to $3 million. To help with the financial burden of Charlie’s uninsured expenses, a fundraising campaign in his honor has been established with HelpHOPELive, a trusted nonprofit organization that has been providing community based fundraising guidance to patients and their families for more than 30 years. All donations are tax deductible, are held by HelpHOPELive in the Mid-Atlantic Spinal Cord Injury Fund, and are administered by HelpHope Live for injury-related expenses only. Please consider making your most generous end-of-year tax-deductible contribution possible to help Charlie and his family to bridge the gap between here… and healed! Click on the DONATE NOW button today. Thank you for your support and prayers for Charlie. They are greatly appreciated. Please be sure to check this campaign page regularly for fundraising events and recovery updates. The latest and the best news I’ve heard is this; Charlie was able to move his toes, pulling them up! …only a few times and then fatigue set in, but that is very promising! The situation is, as I have said before, pregnant with possibility! We will keep praying and Charlie, you just keep working hard,everyday, steadfast toward the goal! Charlie has been home for a couple of weeks now. I think we are doing well working all the bugs out of our daily routine. Charlie is working very hard on recovering. Prayers are being answered one by one…Charlie made it home for Thanksgiving ! Charlie maybe coming home soon. It has been a long road. He went to Philly to have surgery to stabilize his neck. He was there for 2 weeks. He is back at Allied for a 3 week rehab and then home, we hope. We are now waiting for his hospital bed and his wheelchair. Thanks for all your thoughts and prayers. He was in good spirits and reported that against his greater desires they had him get on bike,of all things, as part of his physical therapy. He started out saying, I can’t do this and soon changed his thought process to, I will do whatever they ask of me…now that, was the voice of Authority speaking! They affixed his hands and feet to the push bars and pedals with ace bandages and he spent 20 minutes on an elliptical cross trainer! Who would have thought! One day at a time gets it done…Let’s wait patiently and see what our Lord’s healing plan brings tomorrow…. I had a good visit Sunday with Charlie & Robin. Since the accident on Labor Day, Charlie could not lift his arms or move his legs. In my first visit he talked about his Will and was expecting to die. His pain was severe and he was lubed up pretty good with an IV drip and oral dosages as well. An agonizing condition for me to see my friend in, left me completely unravelled. He was understandably scared and very expressive about his love for us all and in his very own humorous, drug induced way, he assured us that all this love talk must be the medication talking! Complications and setbacks included Blood Pressure drops and Pulmonary Embolism. The good news is this; The spinal column is well aligned and there is no break or even pinching of the spinal cord, so a lengthy, hopefully full recovery is possible with a lot of hard work. His pain is now being managed with some drugs, and ice packs. Excellent healthcare professionals, God and the healing powers of our Lord and Savior Jesus Christ, through prayer, are offering Hope. Charlie finally made it out of the intensive/critical care unit from the hospital and has been moved to Allied Rehab about 10 days ago. While he isn’t quite able to use his hands yet, he was able to reach out and share a big hug with me as we cried together. Now that’s progress! Robin is an amazingly loving wife and the best advocate Charlie could have. She is a registered nurse who retired from the practice of nursing many years ago but has stayed certified with education and bi-annual exams and has shown the people in charge of healthcare that she is a humble but qualified colleague in the medical field, assuring them, and Charlie, and me that he WILL get the best care possible. I have personally witnessed her being asked by nurses and consulted with about different drugs, names and generic names, and their effect, and interaction with each other…wow. Prayers are heard, and answered, in His time. In the meanwhile, cards and notes and pictures help lift the spirit, planting seeds of love for hope, and though a pregnancy of possibilities, offering the birth of a full recovery,…because all things are possible through Christ who strengthens us!! Please help them in this time of need to be strong and to feel the love and support that is poured out over them through our thoughts and prayers and any other way you may be able to offer hope and comfort. Charlie & Robin, My visit with you over the labor day weekend marks the 2nd year anniversary of the accident...I am amazed and very impressed with the great attitude and spirit in which you've come through this challenge of adapting to the life changes that have been placed on your path...You said it best Charlie, "this is what a marriage is truly about", Robin's persistence, patience, professionalism as a nurse with a nurturing but strongly disciplined regimen of medications, diet, therapy schedules, and encouragement all laced with a love that shines above all the smoke. God bless you both. Stay strong and know that you are always in our thoughts and prayers and we will look forward to seeing you again soon, hopefully in Florida this winter! okay? Hello Charlie and Robin, it was good to talk with you last week, and even better news that you are moving your left fingers, and starting to move the left foot toes. Keep pushing yourself and don't forget 2 months ago you could hardly see any fingers moving...soon you'll be making a fist, and tapping your foot. Be well. We are all thankful for something, some things different and some things similar...but I'll bet I speak for everyone who is thankful for you Charlie! Thank you for all your hard work and the perseverance that got you back home to start the next leg of this journey. The hard work is only yours to do but know that we are always here with you. The world believes that seeing believing. Believers know that believing is seeing..."I can do all things through Christ who strengthens me" Philippians 4:13 I look forward to visiting with you soon. Before Christmas is my hope. Sending prayers and thoughts your way.